Just as some people are Ford Families, or are from the "Right Religion" or have to have a Pool in the yard, there are some families that insist on a certain breed of dog. Every breed has a personality. English Bulldogs are a friendly stubborn doorstop. Yorkies are yappy little terrors. Mc Nab Dogs like my Lettie make all other dogs look like they're brain dead in comparison. My neighbor had a very old Samoyed. A beautiful older dog with a gentle personality that insisted that you say hello and then she'd go on about her own thing. That dog, Priscilla died a while back and I wrote about her absence here. They had said that eventually they would have another. Their own experience with Priscilla was one that they wanted to have it again. Recently, about a year and a half after Priscilla had gone, they returned with Olivia. Where Priscilla was regal and gentle and slow from her advanced years, Olivia is all energy. She's basically a snow white charger running headlong to greet the day, any person or dog, or tree in her path. Typical puppy, she'll stop and look at you, bark and then go on what she was doing, which is to say at that point I am greeted by white paws usually jammed in my crotch and my doubling over to avoid further contact. All that energy has to have an outlet, and my own Lettie, now nearing 11 years old on Thanksgiving, has realized that she will be part of that. Olivia is harmless, completely. Lettie on the other hand is terrified. Put the two together and I become the center post of a furry merry-go-round, spinning to avoid being wrapped up like a Maypole. Since the 5:00 hour in the evening is the Dog Walk Hour, everyone is out. My neighbor usually gets out before we get a chance to get Lettie leashed and around the corner so they're gone and out of sight. That is until we round our respective corners. At that point, Lettie immediately tries to go at right angles to our current travel, and Olivia becomes a white charger towing her owner towards us. I have given up trying to get Lettie to be social, at 11 years old it won't happen. 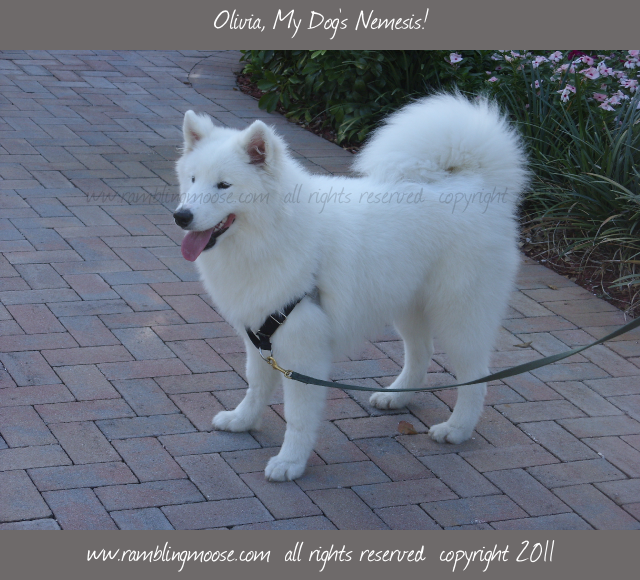 Olivia is friendly and exhuberant and all fur, bounce and bark at this age. This has become a canine illustration of the Immovable Object and the Irresistible Force. An amusing interplay of an unsocialized older dog and an over eager pup. Chaos ensues and it is always entertaining. Soon, this rebound hound will end up with another white streak. They're going to have a younger sister for Olivia. Lettie doesn't know what's in store for her then, poor thing. She's in for a thorough sniffing then! High energy dogs always require a special care and I'm looking forward to see what the addition of the other dog will do to the dynamics. Here's hoping they entertain each other and they're beautiful additions to the neighborhood.